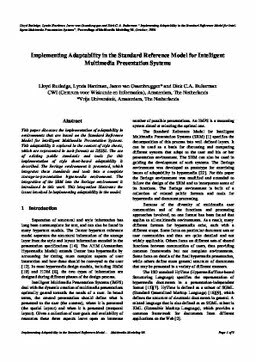 This paper discusses the implementation of adaptability in environments that are based on the Standard Reference Model for Intelligent Multimedia Presentation Systems. This adaptability is explored in the context of style sheets, which are represented in such formats as DSSSL. The use of existing public standards and tools for this implementation of style sheet-based adaptability is described. The Berlage environment is presented, which integrates these standards and tools into a complete storage-to-presentation hypermedia environment. The integration of the SRM into the Berlage environment is introduced in this work. This integration illustrates the issues involved in implementing adaptability in the model.